All details of information you need to know about business creation in France. You own a rental property, or you want to buy to let in France. 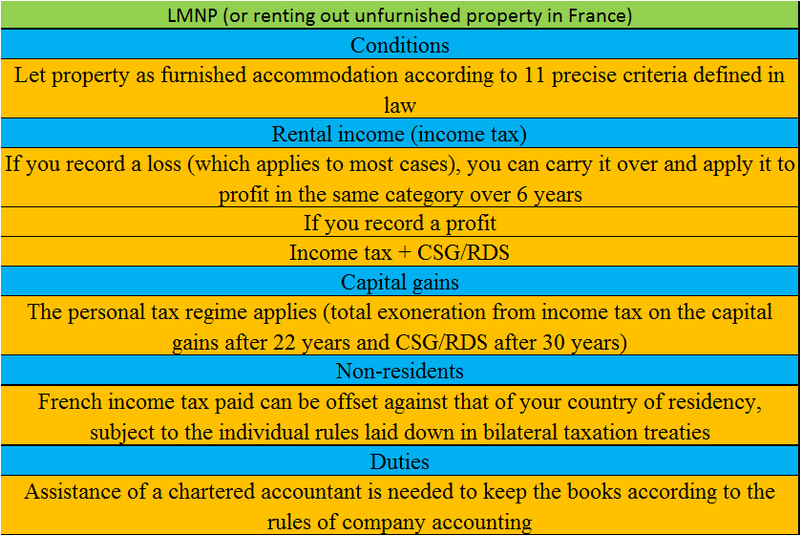 Whether are you are a non-resident or fiscally resident in France, there is a very handy arrangement called LMNP (Loueur Meublé Non Professionnel) that allows you to benefit from (i) the advantages of company taxation on the rental income and (ii) the advantages of personal taxation on the capital gains. If you think this solution is for you, you also need the assistance of a chartered accountant. Let us explain. Letting furnished property in France and income from property rentals. Rather than let your property in the usual French way (unfurnished), rent it out furnished. The appartment should meet 11 criteria by law and be rented out to a person who uses as a principal residence. This will allow you to deduct all the costs you incur as a landlord. In practical terms, it means that you can deduct from the taxable income (i) the depreciation of the property (ii) all the purchase costs (stamp duty, conveyancing fees) and (iii) the day-to-day costs of owning a property (management company charges, insurance, costs of repairs, etc. ), local taxes and interest payments. If you rent out your property unfurnished, you cannot depreciate the property, not can you deduct the purchase costs or some of the running costs (those of a caretaker in particular). Also, in view of the rules for calculating the taxable income, which are far more favourable for furnished rentals than unfurnished ones, you will probably record a loss in the first case, but a profit in the second. To make use of this arrangement, you must use company accounting, which by law requires a chartered accountant. Even though you can deduct the depreciation of rental properties from your taxable income, the accumulated depreciation is never subtracted from the gross value to calculate capital gains. In other words, the rules of company accounting do not apply. Rather, the capital gains tax is calculated according to the rules for personal taxation. You benefit from a sliding scale of taxation on the price of sale over the course of the time you own the property, so that you are totally exonerated from income tax on the capital gains after 22 years, and from the CSG/RDS social security charges (if these apply to you) after 30 years. To sum up, capital gains on property calculated according to personal taxation rules by and large taxed less than those computed according to company taxation. If you are fiscally resident in France, losses from letting a property as LMNP are not deductible from your overall income because they do not come from a professional activity. They can, however, be applied to income of the same type over the following 6 years (10 years before 1 January 2017). If you have recorded a profit, it is added to your overall income and taxed as income according to your tax band (IRPP – impôt sur le revenu des personnes physiques). In addition to this, you will pay the social security charges CGS/RDS (15.50% of the taxable income). As for the capital gains, they are taxed as income in the same way as the rental income. If you are not a French tax resident, you must submit a tax return to the centre for non-residents. As long as a property is situated in France it is taxable in France. When your taxable income only concerns the LMNP this tax return becomes a simple formality. Taxes on capital gains from property are levied at the proportional rate of 34.5% and paid on the day of sale in front of the notary. If, however, you pay income tax and CSG/CRDS, you can deduct this from the tax paid in the country in which you are resident, subject to the double taxation avoidance treaty that may exist between your country and France. Jean-Claude ARMAND and Partners assists you to keep books according top the French rules. Doing Business in France – The context and underlying questions..
You represent a foreign business that wishes to start an operation in France and you know little or nothing about French business law, or tax and social security legislation. In particular, which legal status should you choose, with which fiscal consequences? Do you need to issue a work contract to hire employees? What level of social security charges will be applied to them? What grants and subsidies are available for your business? Why have we produced this résumé of the key points on doing business in France? To give you a “super-summary”, or rather the summary of the summaries of all the advice documents on the internet site. Though these documents treat several subjects in detail, most of them also include very useful tables to clarify things. In other words, if you want to do (that is start a) business in France, begin by reading the document below. It will give you an overview, presented in a more friendly fashion than a simple PowerPoint. In a few zooms, you will master the key points of French legislation for commercial businesses and fiscal and social law. Then, if you wish to go into certain points in more depth, go ahead and consult the advice sheets, which very usefully fill in the details of the above-mentioned document. And where does our accounting firm specialized in starting a business in France fit in? As our document is a résumé it probably leaves some questions unanswered. And the same goes for the advice sheets. If we have convinced you that we are the right partner to accompany you in doing business in France, don’t hesitate to contact us. If you need any additional information we will be happy to assist you. Happy reading, and see you soon! Many foreign businesses underestimate the delays and obstacles they may encounter when opening a bank account in France. These are multiplied if you want to open the account from a distance, without a company director having to visit in person. What follows are a few useful rules that will help you get a head start and open an account in record time. First of all, businesses must have a K-bis, which forms the legal identity card of the company and establishes a branch of the company in France. Indeed, you need to have this document in order to open a business bank account in France. The branch does not have to be considered as such in fiscal terms. In other words, it can have a simple commercial status without a fiscal status. An efficient way to open a bank account in France in the shortest time is to have opened an account in the home country with a subsidiary of a French bank, or one that has concluded a partnership with a banking network in France. In the interests of anti-money laundering, all French banks enquire into the commercial activity, the seniority, the shareholders and directors of a company, and require a minimum of prior existence and turnover before proceeding to open a company bank account. What can you do if you cannot fulfill the conditions in the previous paragraph? There are two possibilities. The first solution is to open a bank account at home with a bank that is represented (or has partners) in France. In this case, it is best to enquire in advance to make sure that you fulfill all the rules for opening a bank account in France. 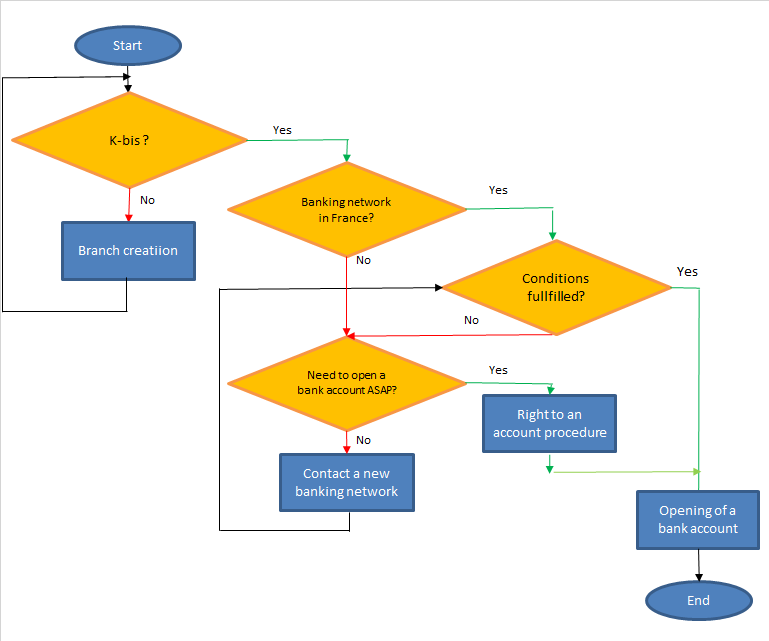 The second solution is to procure the K-bis and then to approach any bank in France requesting to open an account. If the bank refuses in writing, you can resort to the procedure of “right to an account”. By this procedure, the Banque de France designates a commercial bank in which the foreign business may open an account. In other words, the commercial bank cannot oppose the opening of the said account. To sum up, this second procedure exists as a last resort but it carries the inconvenience of being time-consuming. Manager in France: what are your responsibilities? On the verge of being appointed as manager in France, what are your responsibilities according to French commercial law and labor law? To begin with, it is key to know your official title? Manager in France and responsibilities; what is your official title? According to French commercial law, legal representatives of an SAS are primarily the president or by delegation of power the managing directors. Members of the board can also be representatives but this is only optional in an SAS (because the board in this case can only be created by company by-laws). Moreover the manager can be the permanent representative of the company if the foreign group was appointed as the legal representative of the subsidiary. The position of permanent representative is acquired from the moment the legal representative is registered at the Registre du Commerce et des Sociétés (RCS: register that contains every head of company based in France). The president of the SAS has an extensive authority that cannot be reduced. On the other hand, the responsibilities of managing directors or legal representative responsibilities are founded by company by-laws. Legal representatives of an SARL can only be a person. What are your liabilities as a manager in France? Legal representatives are liable on legal and regulatory infractions of the violation of the company by-laws and management misdemeanor. But in practice these legal cases are rare. French commercial law provides specific sanctions for SARL managers. But they are only applied in the case of malicious intent. At this level, the statutory auditor would warn the manager before any action of the court. The Jean-Claude ARMAND and associates firm assists you in the selection of the most suitable choice of legal status when creating a subsidiary in France. https://www.jcarmand.com/en/wp-content/uploads/2016/01/business-incorporation-france-4.png 905 1030 Jean-Claude Armand https://www.jcarmand.com/en/wp-content/uploads/2015/09/start-business-france-paris-2.png Jean-Claude Armand2016-01-12 10:25:182018-07-02 13:07:43Manager in France: what are your responsibilities? Subsidiary in France: which legal status to choose? When a foreign company wishes to create a subsidiary in France, it can either select the SAS status (French simplified joint stock company), or the SARL status (French limited responsibility company). The SAS is comparable to the incorporated company in English speaking countries (or the AG in Germany), whereas the SARL is closer to the LLC (English) or the GmbH (German). An SAS has a significantly flexible legal status. It allows the separation of ownership and management. In such a case, the company’s by-laws can enable the formation of a board of directors where all shareholders (operational and non-operational) are represented. The above-mentioned possibility makes the SAS highly recommended for co-owned companies. In other words, the situation when the foreign company is a shareholder of the French subsidiary alongside with another company. The foreign company does not have to participate on a daily basis in the subsidiary’s operations. An SAS also allows its corporate shareholders to be corporate officers. An SAS does not have to appoint a person as a shareholder corporate officer. This fact provides three benefits on legal and fiscal aspects. The company appointed as the corporate officer does not need to request for any authorisation. However, for individual shareholders this situation differs according to the person’s citizenship. Citizens of the European Economic Area do not have to make any demands either. But other citizens who reside in France must request a temporary resident permit (carte de séjour) If the person lives outside of France, an authorization from the French authorities (authorisation préfectorale) is required. This authorization can be simple to acquire for North American, Australian and Japanese people, but it can be more difficult for others. This aspect enables the driving force of the company to be employed by the subsidiary under contract. Henceforth, it would not be liable on commercial law. On the other hand, legal proceedings practices on corporate officers are extremely rare. Lastly, if the subsidiary only has one shareholder, it is not mandatory to appoint a permanent representative. The appointment of companies as corporate officers significantly eases management fee invoicing and considerably limits the risks of non-deductible costs for the subsidiary. If managers are at the same time a company and a person, a close consideration should be done on the management fees scope to be sure that it does not come in conflict with the person’s responsibilities. This could challenge the cost deductibility of the subsidiary. The key interest of this legal status is that you do not need to appoint a statutory auditor (commissaire aux comptes) if at least two out of the three following criteria are satisfied: turnover under 3.1M€, balance sheet under 1.55M€, staff under 50 people. The main drawback of this status is that you can only appoint a person as corporate officer (no legal entities). The advantage of dissociating ownership and management is considerably weakened when the associates are legal entities. To sum up, below is a summary of pros and cons of each status when creating a subsidiary in France. https://www.jcarmand.com/en/wp-content/uploads/2016/01/business-incorporation-france-5.png 905 1030 Jean-Claude Armand https://www.jcarmand.com/en/wp-content/uploads/2015/09/start-business-france-paris-2.png Jean-Claude Armand2016-01-12 09:32:502018-07-02 13:08:17Subsidiary in France: which legal status to choose? A simple identification at social bodies or a liaison office: how to choose? If starting business in France boils down to hiring one or two staff(s) aimed at collecting information on potential clients, a couple of options are made available to foreign companies. The first is to simply get a SIRET Number, which allows you to be identified towards all French social bodies. The main advantage is that the process of creation is easier than in the second option. The main drawback is that the company needs to process on its own payments to the social bodies. A second option consists in having a liaison office. Unlike the first option, the company is identified in France towards not only social bodies but also all other third parties. This situation entails 4 advantages. First, processing payroll is a less complicated as the accounting firm will process the payment of social expenses on the company’s behalf. Second, the company can open accounts at utilities (such an Internet providers, cells phones) to directly pay these expenses incurred by employees in France. Third, the company can strike a lease agreement in France. This may be key if all staffs need to work in the same location to be efficient. Finally, being identified towards potential clients allows to strike deals with them more easily. How to choose between the two options? The first option will suffice if (i) the company does not anticipate a significant increase in its business in France, briefly said thinks it is going to level off rapidly and/or (ii) the employee(s) can work home. This second option is recommended if (i) the company wants to open a branch in a foreseeable future (as switching from a liaison office to a branch is simple) and/or thinks (ii) having a liaison office will increase the likelihood of striking deals. This may be the case with some very large accounts and public ones. Jean-Claude ARMAND and Partners advices you to choose the establishment structure in France (liaison office, branch, subsidiary company). https://www.jcarmand.com/en/wp-content/uploads/2014/09/business-incorporation-france-6.png 905 1030 Jean-Claude Armand https://www.jcarmand.com/en/wp-content/uploads/2015/09/start-business-france-paris-2.png Jean-Claude Armand2014-09-25 19:00:022018-07-02 13:08:49A simple identification at social bodies or a liaison office: how to choose? 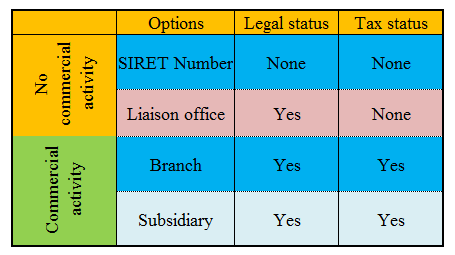 Liaison office branch or subsidiary: how to choose? Answer: In order to establish a business in France, does a foreign company have to systematically create a subsidiary company? In other words, can we find solutions more flexible, less expensive? A simple registration towards social bodies to hire staff, or a liaison office, or a branch. The answer to this question depends not only on the means that will be deployed in France. If in particular, the foreign company creates a liaison office, it has to be very strict concerning its operations. If the foreign company simply wishes to hire one staff aimed at having contacts, collecting information, giving information for the mother company’s account, or assuming the advertising of it, it can consider two options: the first is to simply get a SIRET number to be registered towards social bodies. The second consist in creating a liaison office. To decide which the most suitable option is between a simple SIRET number and a liaison office – click here. Consequently, the employees must never sign any order form in both these aforementioned situations. They have to be signed by the mother company’s representatives in the country of origin. Concerning fiscal law, the liaison office does not have a literal existence. The charges of the liaison office are in principle deductible from the taxable income of the foreign company in its country of origin. However, if the liaison office has in fact commercial activities (see above), it can be requalified as a permanent establishment. In that case, in order to retrieve the French VAT that has burdened the prices of goods and services bought in France, the foreign company must appoint a fiscal representative in France. Such an appointement is not required if company is situated in a EU-Country. If the activity within France is commercial, the mother company has to create a new branch. In order to do so, it has to register to the RCS in the 15 days following its opening, and appoint a representative for France. If the representative is not an EU citizen, he must, most of the time acquire a trader’s card (carte de commerçant), which is an authorization to do trade. Finally, every year, the foreign company has to file the annual accounts translated by a sworn translator to the aforementioned RCS. According to the French tax regulations, the branch is considered as a permanent establishment, which designates for the purpose of tax treaties between countries of the OECD, a fixed establishment of business where the company practices all or a part of its activity: Are in particular permanent establishments, headquarters, transformation plants, construction sites which in time exceed 12 months. Are not considered as permanent establishments, non-commercial activities as storage, exposition, delivery, transformation by another company, etc. Consequently, the branch is subject to corporate tax according to the common law rate. To determine its fiscal income, the accounting income needs to be restated, mainly to take into account that the branch is only an extension of the foreign company, which cannot be considered as a different legal entity. Moreover, the VAT of importation from countries belonging to the EU is not due. However, it must be paid for importation from other countries. For this purpose, the company has to appoint a fiscal representative. Finally, the company can create a subsidiary company; which is detached from the mother company. The income is taxed in France (see Milestones when starting a business in France). Jean-Claude Armand and Partners advices you to choose the establishment structure in France (liaison office, stable establishment, subsidiary company). https://www.jcarmand.com/en/wp-content/uploads/2014/09/business-incorporation-france-7.png 905 1030 Jean-Claude Armand https://www.jcarmand.com/en/wp-content/uploads/2015/09/start-business-france-paris-2.png Jean-Claude Armand2014-09-18 18:00:412019-02-17 15:21:57Liaison office branch or subsidiary: how to choose? If you are a natural person, you can choose the status of individual entrepreneur. This status, which is not expensive and easy to obtain, is particularly suited to activities involving little capital, with a very small operational risk (consultancy business) and with revenues not exceeding €60,000 a year. On the other hand, if as an individual entrepreneur you do not meet the above criteria, or if you are a foreign company wishing to become established in France, it is preferable to incorporate a company. Such a solution allows a full separation between the equity of the latter and that of its shareholder(s). Thus you will only be liable for up to the amount you have contributed. For individuals, the company limits among other things the mandatory charges and it preserves the company’s equity, and hence that of its partner(s) or shareholder(s). Foreign companies may choose to establish a branch. However, this solution is nearly always very costly in regulatory terms, and it does not even secure contributions, because the branch is not a legal entity separate from the company. Finally, they may opt for a liaison office (bureau de liaison in French), if they just need to promote their goods or services to potential clients and collect information from them. In other words, this legal form in France is relevant if the decision-making power (especially that of approving sales orders) remains in the foreign company. EU members wishing to establish a business in France are not subject to any restrictions, Non-EU members such as Americans must meet a number of conditions. How are profits made by branches and subsidiaries taxed ? Foreign companies’ branches and subsidiaries are taxed on profits made in France. Therefore, the profit has to be separated from the one made by the parent company in the country of origin. Yet, taking in consideration the economic dependence of the branch or the subsidiary from the company it belongs to, the French fiscal administration can challenge the amount of profit made by the subsidiary or the branch. In these circumstances, what can be done to avoid such a situation to arise? On principle, it has to be demonstrated that the products and expenses recorded by the French branch or subsidiary have been invoiced upon market conditions. In other words, the revenue and the expenses have to be invoiced as if no capitalistic relations existed between the French entity and the group. In practice, how to do it? For that purpose, the branch’s or the subsidiary’s economic model has to be taken into account. If this entity acquires products or services abroad and sells them back in France (from a tax perspective, merchandise or services transfers from another county towards the French subsidiary or branch is always considered as a purchase), it has to prove that the transfer price to the entity covers the global cost, with a margin consistent with professional practices. If the prices proposed by the competition are not known, the entity can base itself on prices charged to companies external to the group. If on the other hand the branch or the subsidiary only plays the role of intermediary between the group and the end costumers in France (in other words, the parent company sells directly to French clients and the branch merely prospects for them), the French subsidiary or branch can conclude a “marketing service agreement” with the parent group by which the latter can have its committed cost reimbursed with a margin. The difficulties arising from such a contract called “cost plus” are double: primarily, the margin calculation base has to be established. Does this calculation base only include operational expenses, or the total expense, including or excluding financial expenses and/or exceptional charges? Furthermore, what margin rate can be applied on expenses logged in accountancy? Often, there is a 10% rate applied on the entire charge recorded by the subsidiary or branch. The French entity can also set the rate according to the gross sale margin that it would record if it had acquired and resold the product. It can also base the percentage on the commission rate it applied or would have applied to distributors. The creation of a subsidiary often follows the end of contractual relations with a local distributor. In the absence of such a situation, it is possible to base it on market condition commissioning practices. Resorting to the first of the two above-mentioned methods could have the advantage of reducing the taxable profit in France during the start up phase, considering that the establishment of a distribution business in a country is rarely profitable the first years (as a reminder, the French corporate tax rate is 33,33%). Conversely, at cruising speed, i.e. when the business is profitable, applying a 10% rate to expenses can be more interesting. Indeed, taking into account a margin rate as if the subsidiary was selling products to the parent company, or if the subsidiary was collecting a sales commission on the group can result in the application of a rate superior to 10%. The choice between the first method, which constitute a less risky economic model (the entity will still declare its profit in France), and the two others, more risky, will depend on anticipated taxable profit in France. Of course, as explained above, it is appropriate to describe the chosen methodology and to document it. And if the company wishes to go from a flat rate to an effective rate (and vice versa), it has to justify this change and support it by a convincing documentation. What may occur when creating a liaison office, a branch or a subsidiary in France..
Whatever the legal form chosen (subsidiairy, branch or liaison office) to carry out business in France, sometime foreign companies hire one or several employees before creating a legal and official entity in France. This exposes the new entity to three risks. See the following explanations. Computerization has tightened regulation, even in the case of a subsidiary a branch or a liaison office creation in France. Foreign company must keep at mind two things when they set up their business in France: first of all, the welfare fiscal regulations and commercial regulations are rigorous. Additionally an increase in the French administration computerization makes impossible common practices accepted 3-4 years ago. For instance, a few years ago it was possible to file various declarations on paper after the deadline without any penalty. This is not possible anymore. And now the risks you are exposed to if you do not abide by the current rules. Hiring workers before the creation of the legal body exposes the entity in France to the three following risks: firstly, it can be sued for concealed work. Is considered, among others, as concealed work declaring to welfare organisms the recruitment of a worker after its actual recruitment. Indeed, the creation of an entity in France leads to the issue of a registration number called SIRET, which is required to be identified among welfare organisms and to issue declarations. Therefore, the document indicating to welfare organisms the recruitment of a worker (called DUE) cannot be issued before the registration date and it is absolutely impossible to backdate it. Admittedly, the risk to be sued is low from the moment that the legal entity in France did not have the will to escape from labor law. The sentence for concealed work can go up to a maximum 225 000€ fine. The second risk is to declare welfare contributions a year late. Indeed, every paid salary during the fiscal year must be declared to social welfare organisms before January the 31st of the following year. Therefore, salaries that have not been declared the current year can only be declared the year after. The company then exposes itself to surcharge for late payment in the case of a control by welfare organisms. As for the employees, they risk (1) not validating welfare quarters, reducing their retirement, (2) an increase in their income tax basis the year the revenues are declared. (Income tax in France is a progressive tax). Lastly, if the French entity has to contribute to welfare, the activation of this coverage cannot be done before the date of registration. In effect, if the employee suffers from an accident whatever the reason between the date of recruitment and the beginning of the coverage, the French entity will have to pay the daily allowance instead of the welfare organization. To sum up, the establishment in France has to be properly anticipated for regulatory purposes. It is essential to manage at once the creation of the French entity and the recruitment of future employees. It is the best way not to end up in the situation above mentioned. The main forms of capital-based companies are Limited Liability Companies (S.A.R.L. ), Simplified Incorporated Companies (S.A.S. ), and Incorporated Companies (S.A). The choice between these three solutions will depend on strategic and managerial considerations. An SARL is chosen (i) if the capital is meant not to change hands and (ii) if all or a majority of the partners are likewise the directors of the company. If any of these conditions is not met, then one should choose between an S.A.S or S.A. The choice between an SAS or an SA is linked to the capital structure. An SAS is recommended when there is only one shareholder or if the shareholders all share the same goals. It is generally managed by a chairman, who may be assisted by general managers or CEOs. An SAS does not have a minimum capital requirement. This legal form is particularly recommended for affiliates of foreign groups. An SA is suitable whenever the shareholders do not all share the same goals (for instance in joint ventures) or for companies carrying out regulated activities (banks and insurance companies). The minimum capital of an SA is €37,500. An SARL and an SAS must appoint an auditor (CAC) whenever they fulfill certain criteria. All affiliates of foreign groups are under the obligation, in fact, of appointing a statutory auditor (CAC). Whatever the type of company, the chartered accountant (CAC) is appointed for a term of 6 years (Also see accounting regulations). 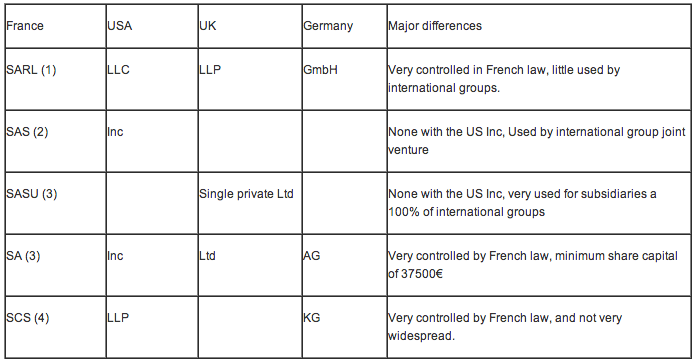 Here is a table of company forms equivalence existing in France and others in the USA, UK and Germany. Equivalence does not mean that these types of companies are absolutely the same. Moreover, it is difficult to detail all of them. Therefore, we have put forward the major differences between the French company forms and their foreign counterparts.